A classy portable stereo recorder with the added attraction of multi-track recording for songwriting, working out arrangements and for creating quick demos. Solid build; sound quality; nice balance of facilities. You have to hit record, then play, then record when adding tracks in multi-track mode; you can't drop straight into recording from zero position. The Olympus LS-10's build quality is superb. The LS-100 can be used as a USB audio interface and has phantom power for mics. Portable stereo recorders take many shapes and forms: pocket-sized units small enough to be carried anywhere, some with video as well as audio recording, and those that are a little larger but have more pro-level features. The LS-100 from Olympus falls into the latter group, with XLR inputs and phantom power to connect quality condenser mics. It can still be hand-held, but at over six inches tall is a touch too large for most pockets. 'The LS-100's multi-tracker is rudimentary, but it's just fine as a musical sketchpad for knocking ideas together, working out parts and putting a quick demo together." Perhaps of most interest to musicians is the LS-100's true multi-track facility offering a total of eight tracks. It also has an onboard tuner and a metronome. The LS-100 records audio up to 24-bit/96 kHz quality. WAV or MP3 files are recorded to removable media in the form of SD cards up to 64GB but there's also a convenient internal memory of 4GB. Power comes from a lithium-ion battery that can be charged via a USB connection to a computer or the included mains adaptor. The USB allows transfer of files between the LS-100 and a computer, but also allows the unit to function as an audio interface or a USB mic if you want to record to a DAW. With a build quality that inspires confidence, the LS-100 has a tripod mount so you can set it on a stand and point it at a stage to record gigs. The unit is easy to use with ergonomically arranged controls and a detailed colour display, complemented by a voice through the onboard speaker or your headphones that tells you what function you are using. Initially you can scroll and select one of five options - tuner, metronome, stereo recorder, multi-track or Lissajous - the latter being a useful graphical display to aid placement of the recorder relative to a sound source. Using the stereo recorder, the sound quality captured through the onboard mic array (two mics angled at 90º) is excellent - stick it in front of your acoustic guitar and you'll get great results. Alternatively, you can use a different set of mics or record electric guitar through the standard jacks, either plugged straight in or via a Line 6 POD or similar. The unit can apparently handle SPLs of up to 140dB so loud gigs should present no problem. The LS-100's stereo recorder has a couple of other tasty features worth mentioning: there's a hands-free 'voice sync' function, where the unit will automatically start recording when you start playing/singing, and the playback speed is also changeable, giving you a phrase-training facility if you transfer in a piece of music you'd like to slow down and play along with. The stereo recorder also has an overdub mode, which gives you the chance to quickly add more layers to any track. But if you want something a little more sophisticated, there's the multi-track mode where you can record a mixture of stereo and mono tracks then either mix them down to stereo with control over panning and volume, or transfer them to a computer DAW for further work. If you use up all eight tracks and need more, you can bounce them together as a stereo WAV, assign it to a pair of tracks and free up the other six. The LS-100's multi-tracker is rudimentary (there's no reverb or EQ so it's not the type for creating finished masters), but it's just fine as a musical sketchpad for knocking ideas together, working out parts and putting a quick demo together. 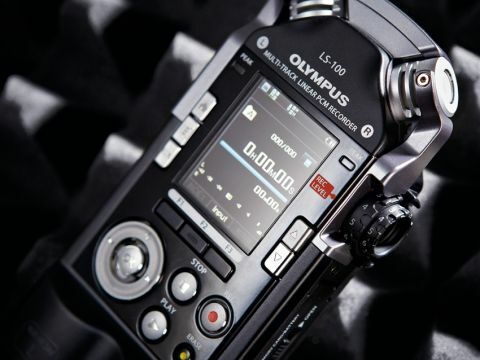 If you want a portable device to make serious field recordings, the LS-100 has the attributes and is ideal if you want quality recordings of your live shows. It's good for other recording, whether just grabbing ideas or using the multitrack facility. It's not the cheapest in the portable stereo audio-recorder genre but it stands out for having probably the most practical array of facilities for musicians.